Recently I have been doing a bit of soul searching about a number of things but in particular my career. I've just completed my second year at University studying Public Relations and I see myself in a career revolving around the media and beauty industry. These days there doesn't seem to be one clear path into entering these kinds of careers in PR, journalism etc so I decided to read into how some of the people I look up to work and made their careers. 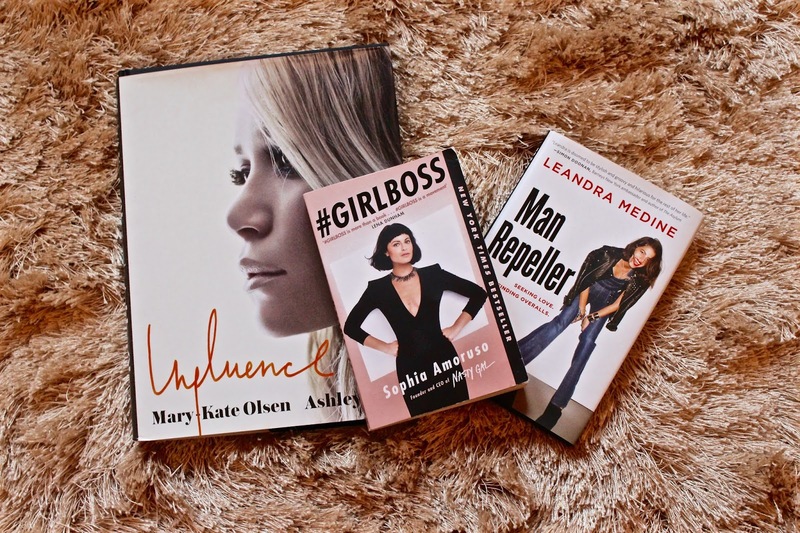 Influence by Mary Kate & Ashley Olsen is a beautiful book that discusses the people that have influenced the sisters wildly successful careers in fashion. It includes really beautiful fashion photography and one off, candid interviews with Karl Lagerfeld, Diane Von Furstenberg and Christian Louboutin to name a few. It is definitely a beautiful coffee table kind of book, but I absolutely love to browse through it with a coffee after a long day and it always fills me with lots of inspiration to write. #Girlboss by Sophia Amoruso is one of those books that once you have read it you find yourself plotting your own future plans and ideas hit you left, right and centre. This is a sort of business book that offers a look into the way Sophia went from a lost teenager selling her clothes on Ebay to Executive Chairman of Nasty Gal, one of the fastest growing retailers of the moment. Her funny observations about her success and tokens of advice are completely remarkable and her positive attitude to female empowerment and not over-looking her incredible worth ethic is really inspiring. Man Repeller: Seeking Love. Finding Overalls. By Leandra Medine is probably my favourite of the trio and its mostly because of her candid storytelling that touched my self critical, clumsy inner-teenager. Leandra tells stories of her girlhood exploring fashion which any self-confessed fashionista could relate to in such a way that its almost as if you were there living the hilarity. I found the rise of her blog really interesting and reading this book reinforced my opinion that an animated and infectious personality mixed with relentless hard work is really the key to success. I've been wanting to read #GirlBoss for a while, heard so many good things about ti! I listened to her podcast though and wasn't sure if i would like it.. hm..
Never seen the Olsen twins one, wow, i adore them too!